BITS Pilani Students Get Selected in "School of Innovation India from Facebook and SV.CO"
Two teams “VR Bros” and “Holosight” from BITS Pilani, Pilani Campus are selected for “Virtual Reality Program” under “School of Innovation India” from Facebook India and SV.CO. 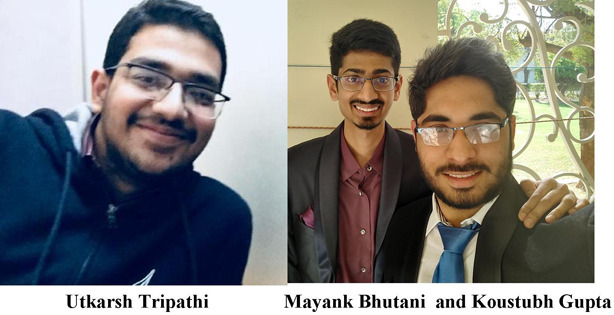 Mayank Bhutani and Koustubh Gupta, two fourth year undergraduate students, are part of the team VR Bros and a third year undergraduate student, Utkarsh Tripathi, is the sole member of the team HoloSight. These two teams among other selected teams will receive the benefit of participating in six months’ program, which begins on August 1, 2018 and ends on January 31, 2019. The Virtual Reality Program is the first program under School of Innovation, which is focused on Virtual Reality as an emerging technology area, and as a part of this program, 10 student teams from across colleges in India are selected to build a next generation Virtual Reality product idea that they propose to have. 1151 applications were received and all teams had to participate in Unity Coding Task to get selected into the program. In Unity Coding Task applicants had to make a game with first/third person perspective car driving experience. Only 102 teams were able to successfully submit the game on time. On the basis of some pre-defined tasks and creative features added in their games, the Judging Panel shortlisted top 20 teams out of 102 teams. Then the Shortlisted Teams were interviewed by the Judging Panel through video conferencing regarding their Coding Task and previous experience in Virtual Reality. Thus, from those 20 teams, final top 10 teams were selected for the program. The School of Innovation India aims to foster future talent in emerging technologies and bring cutting edge technologies to India for ambitious students. It will help students to work with new-age technologies, learn how to build products while in college and scale new heights under the guidance of the Industry.